Welcome to hunterdonlawyer.com the web guide to, and for, the Hunterdon County Legal Community. Here you can use our extensive resources to find a Hunterdon County lawyer, information on the legal system and the law, access the Hunterdon County Justice Center and public legal records, buy and sell a home in Hunterdon County or locate a real estate broker, a mortgage lender, a surveyor and more. 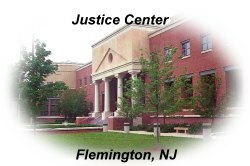 The Hunterdon County Justice Center, the hub of all legal activity in the County, is located at 65 Park Avenue in Flemington. The Justice Center houses the Court Rooms and the Chambers of the Superior Court Judges who hear Criminal and Civil cases – the Criminal and Civil Division staff – the Hunterdon County Prosecutor's Office – the Grand Jury – the Hunterdon County Surrogate's Office – the Probation Department – and an underground secure tunnel to the Jail next door. Looking for a office of a Hunterdon County attorney? Samuel Southard, U.S. Senator, N.J. Governor & Secretary of the Navy, erected this building in 1811. It served as the Office of Governor Vroom from 1817 to 1819 & Alexander Wurts from 1820 to 1881. The building is currently located at 57 Main Street in Flemington. 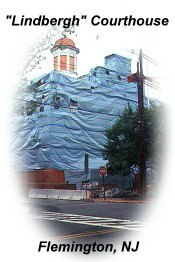 The Historic "Lindbergh" Courthouse is under renovation, restoration, and construction – as is hunterdon-lawyer.com. This fall the restored Courthouse will be formally unveiled – as will our site. Register below and we will provide you with updates on the status of both construction projects. 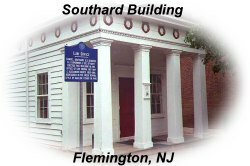 The Historic Courthouse is at 71 Main Street in Flemington and was the site of the trial of Bruno Richard Hauptmann, accused of kidnapping of aviator, Charles Lindbergh's baby. Hauptmann's trial galvanized the interest of the world. He was convicted and electrocuted for his crime. The law has a long history and foundation – click here to obtain access to sources for New Jersey laws, legal cases and decisions along with pending New Jersey legislation. Please register to receive notice as new sections of our site come online and e-mail us with your comments and suggestions.